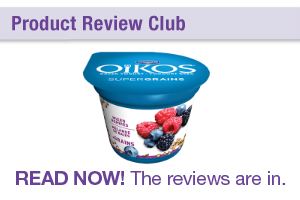 As a dietitian, I feel that it is super important to be up-to-date on new products that come out in the market. It’s just a matter of time that clients will ask you about them and it’s always good to have an informed option. Some food products start out as natural health products before they make it into the mainstream food/grocery stores (Stevia is an example of that). I had heard of Stevia and seen it in natural health food stores for a decade (that’s right, 10 years) before it made its way onto grocery store shelves. A new health product was brought to my attention recently – phytoplankton. It is derived from seaweed and is thought to have beneficial health properties in terms of eye heath and also has antioxidants which can help to protect the body from harmful free radicals. I was fortunate to receive a complimentary sample of this product and tried it out for seven days. This product is available as both a powder (which you can mix into things like yogurt, soup or even water) or tablets. There is even a moisturizing lotion as well. I decided to try the powder as I really wanted to gain a good understanding of what the product is. 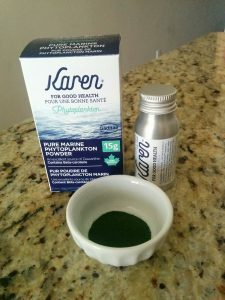 Karen phytoplankton comes in a small sealed jar with a scoop that’s about 1/8 tsp. The dosage that is recommended is to take 1-4 scoops each day. The powder is finely ground and a deep green colour (similar to the colour of seaweed). It tastes a lot like seaweed but to me, it also tastes very fishy as well and is quite strong. I added it into water but the flavour was just too strong for me so I used it in yogurt (to help mask the flavour). I do find the fishy/seaweed flavour to be a overpowering which made it hard for me to have more often. 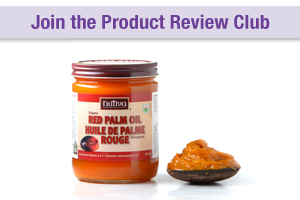 The active ingredients in the product are zeaxanthin and beta-carotene. Both are plant based carotenoids which act as anti-oxidants in the body. Zeaxanthan has been studied particularly for its potential benefits regarding eye health. I didn’t notice any difference in terms of my energy levels and how I felt but I did notice that my nails seems to be quite a bit stronger and less brittle the week that I did take it. However, neither of the active ingredients are known for their nail health benefits. Who knows, I might have had even more noticeable results if I took it more often (2-3x a day over 2-4 weeks) but to do that I would probably switch over to tablets to make it easier for me to take since I am not a fan of the flavour. But this might be a way for people to get in a good amount of anti-oxidants in their diet. Having said that, eating more carrots, red bell peppers, kale, seaweed and butternut squash would be a more enjoyable and more sustainable way for me to get these nutrients that taking it as a supplement. But this might work for some people. It will be interesting to see if phytoplankton makes its way onto grocery store shelves. 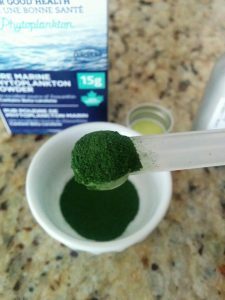 Have you tried phytoplankton before? What did you think of it? Did you noticed any difference with your energy levels? Disclaimer: I was provided a complimentary sample of this product to try but all opinions are my own.